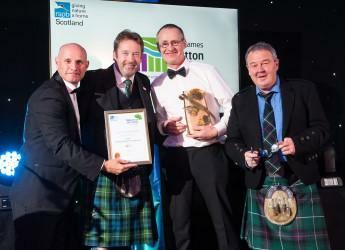 The James Hutton Institute was proud to present an award at the prestigious RSPB Nature of Scotland Awards in Edinburgh last week. As sponsor of the Food & Farming category, the Institute supports the awards’ promotion of 'passionate commitment' to wildlife and sustainable practices. The trophy was scooped by Ruthven Farm, Tomintoul, where farmers the Simmons family impressed the judging panel with their responsible approach to conserving biodiversity whilst running a commercial farm and providing an inspirational model for others to do the same. Jim Simmons credits the benefits of being based in a favourable habitat, having a farm management plan and support from landowner the Crown Estate and its approach to management of the estate. At Ruthven Farm, the Simmons have created habitats which serve conservation as well as commercial farming objectives. They have established woodlands to provide shelter and help reduce water run-off, nurtured rich meadows with hedgerows and wader-friendly wetlands which help with natural flood management as well as providing water for livestock. Director of RSPB Scotland, Anne McCall, said: "It's inspiring to see so many people dedicating their time to protecting our country's precious natural heritage, especially the number of young people who are making a real difference by engaging in conservation. "Hopefully, by continuing to talk about and celebrate these fantastic achievements, we can encourage even more people and organisations to get involved and help give nature a home in Scotland." RSPB Scotland's Nature of Scotland awards celebrate the inspiring people, projects and organisations across different aspects of nature conservation in Scotland. For a full list of 2017 winners, visit the Nature of Scotland Awards website.